You can match your eye color to your outfit, hair color, make up color or just change the color for fun. Honey, Grey, Turquoise, Hazel and BrightBlue will offer better color change on dark eyes. Order discount contact lenses online. 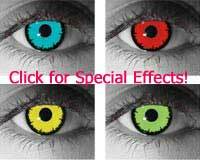 1800Color.com offers a full range of disposable, colored contact lenses. There are inherent benefits when you order contact lenses online. Since there is less overhead, the savings are passed on to you by offering discount contact lenses. For all your discount contact lenses and accessories, add 1800Color.com to your "Favorites" list. © 2004-2012 1800Color.com All Rights Reserved.